With no offense to the practitioners of the culinary arts, you just can’t beat the taste of a freshly caught trout, skillet fried on an open fire, a hundred miles from the nearest gas-range stove. Need we mention the view? It was designed and built by Mother Nature herself. As for Beaver Camp, well, you can find it anywhere you can land a de Havilland (DHC-2) Beaver, the work-horse float plane of the North Country. As for the fish tales themselves, a great deal of that depends of the company and the day. But as a rule of thumb, consider this: the wider the arms are spread, the greater the tale. 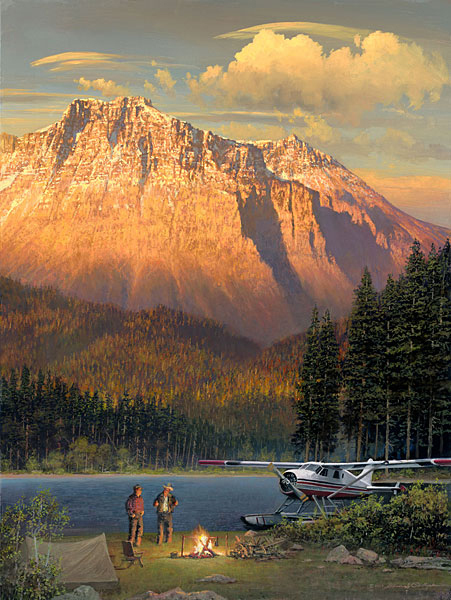 Fish Tales at Beaver Camp and Bill Phillips are featured in the August issue of Western Art Collector. As they say in the story, “Bill produces a sensitive and wonderfully composed landscape, and the depth and perspective of these paintings are outstanding.” We couldn’t agree more.